One of Royal Caribbean's beautiful Radiance Class cruise ships, Brilliance of the Seas can be found cruising throughout the Mediterranean and Middle East. While walking around this ship's seven-story glass-walled atrium and glass elevators, you're sure to appreciate the expert craftsmanship that went into it all. Royal Caribbean allows their guests to choose between Traditional (assigned) and My Time (open) dining, giving them the flexibility and freedom to enjoy their vacation the way that they prefer to do so. 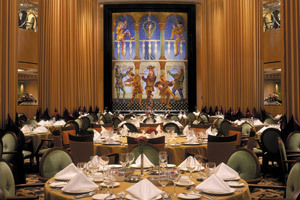 On board Brilliance of the Seas, there's many dining venues. 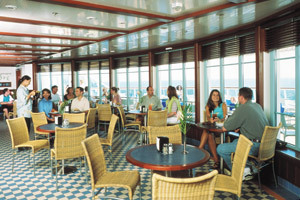 Among them are the multi-level main dining room, Windjammer Café (featuring buffet-style breakfasts and lunches, as well as restaurant-style dinners), the Seaview Café (which has outdoor seating), a couple of upscale, specialty restaurants, as well as 24-hour room service. 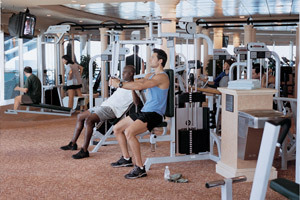 You should never run out of things to do on a Brilliance of the Seas cruise. 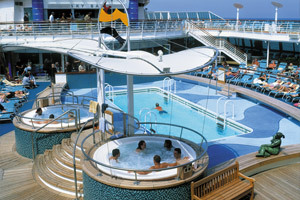 Some of the most popular places to be on board this ship are the Pacifica Theatre (home to live shows on each night of your cruise, including Broadway-style production shows), the Solarium (an elegant space, with a swimming pool and whirlpool), the full-service spa (which includes a beauty salon) and fitness center, as well as an art gallery, library, internet cafe and photo gallery. 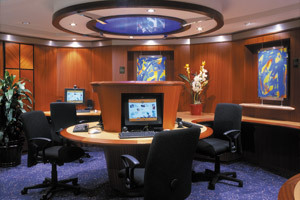 As far as accommodations go, there's a wonderful variety available on board Brilliance of the Seas. There are inside cabins, oceanviews, balconies, junior suites and full suites. Staterooms on this ship range in size from 165 all the way up to 1,001-square feet. 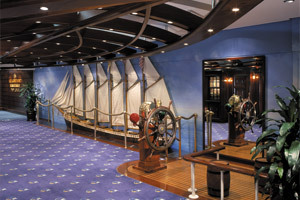 Brilliance of the Seas received many upgrades and additions during its 2013 refurbishment. These included an outdoor movie screen, R Bar, a pub, new dining venues (including Park Cafe, Chef's Table, Chops Grille, Giovanni's Table, Izumi Asian Cuisine, and Rita's Cantina), digital signage, pervasive Wi-Fi, flat-screen TVs, and a nursery. Also during this process, Brilliance of the Seas received new stateroom accomodations, including a new Family Suite. 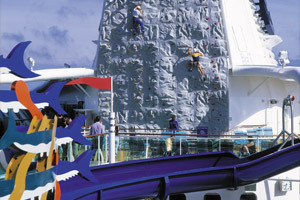 If you're looking for a fun activity to take part in while on a Brilliance of the Seas cruise, consider trying out the large rock-climbing wall that's on board. There are paths of varying difficulty, so people of all skill levels (including beginners) should be able to have a great time scaling the wall. There are two optional specialty restaurants on board Brilliance of the Seas, Chops Grille and Portofino. Chops Grille an excellent steakhouse that also features great seafood options, while Portofino is an upscale Italian restaurant with tasty cuisine and a fantastic wine list. Both of the specialty restaurants on board Brilliance of the Seas have a per person cover charge. If you're like to test your luck, check out Brilliance of the Seas' large casino. Among the possible games that you can take part in while on board are Blackjack, Roulette, Craps, Video Poker, Caribbean Stud Poker, as well as a variety of slot machines. This is an entertainment space with four different, fun-packed clubs: The Bombay Billiard Club, Jakarta Lounge, Singapore Sling's and the Calcutta Card Club. 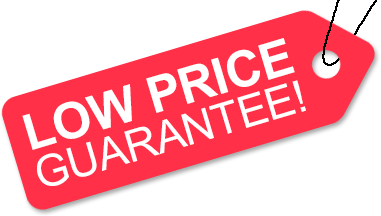 Low Price Guarantee on all Brilliance of the Seas Cruises! Book any Royal Caribbean cruise with us and you'll get the best deal possible, regardless of the ship or sail date! Because of our "Low Price Guarantee," nobody beats our Brilliance of the Seas cruise prices, so look around and you're sure to find the best Brilliance of the Seas cruise deal possible when booking with us! Pre-Paid Gratuities on Brilliance of the Seas Cruises! Brilliance of the Seas Onboard Credit Sale! Get an Onboard Credit when you book a Brilliance of the Seas cruise with us. The value of the Onboard Credit depends on the particular cruise and accommodations you book. Onboard Credit values are listed on Step 3 of the online booking process. We do not charge booking fees on any cruises! 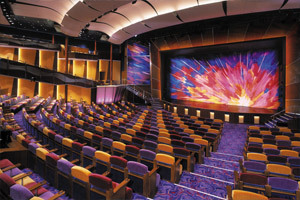 You're sure to enjoy an affordable Brilliance of the Seas cruise when booking with us! 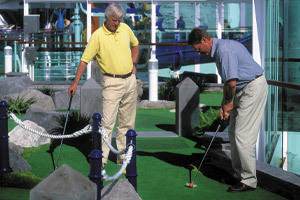 Our special offers on Brilliance of the Seas cruises may not be combinable. Certain restrictions apply to each offer. View terms and conditions during the online booking process. Click a price below to view the Brilliance of the Seas cruises during that month in that destination. Please note: Staterooms 8162, 8164, 8664, and 8662 have partially obstructed views. Deck plans provided are subject to change, and are for May 18, 2015 through April 13, 2017. We reserve the right to correct errors. Please verify all information with the cruise line directly.